The industry has been struck with a series of catastrophic fires that have crippled some large pellet mills from producing pellet fuel. The sudden removal of these suppliers has forced many retailers to scramble for alternative sources. Many pellet mills have had great difficulty building necessary inventory levels due to this year’s weather. Last year’s winter stretched far into spring, depleting much of the inventory normally built up over the summer. Furthermore, with the record wet fall and extremely cold November, many mills have ended up with a historically low level of inventory. Transportation has become more and more expensive and limited due to a growing shortage of qualified CDLA drivers, as well as strict new government regulations on hours of service via Electronic Log Devices. This technology – which is designed to enforce limits on driving time without breaks – has not only pushed many seasoned drivers to quit, but also reduces the number of trucks available overall. All of this significantly affects pellet suppliers trying to move wood pellets to where they’re needed. The price of heating oil always makes an impact on wood pellet demand. When heating oil costs increase, like this year, many pellet stove owners switch back to relying predominantly on pellet fuel. Combined with the rising pellet stove sale rates, this equates to a tremendous amount of new demand for wood pellets this year. All of these factors have made the wood pellet market tight, and it’s possible this may worsen as we get into winter. However – any number of variables can dramatically change the state of this industry. A milder than expected winter; a dramatic drop in the price of heating oil; or a slowdown in the economy can all directly impact wood pellet availability. That being said, the risk of supply disruptions this winter is still significantly higher than in prior years. If you haven’t secured your fuel for the winter, or think you didn’t order enough to safely last the entire season, you should do so immediately. While there are still many retailers selling pellets (including ourselves in certain regions) we cannot be certain on how long the availability will last. For those who remember the winter of 2014, pellet shortages can occur very quickly and without much warning. 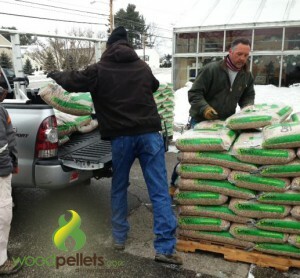 The wood pellet market is in a delicate state and vulnerable to supply disruptions – which is why we strongly recommend you secure your pellet fuel while you still have the opportunity.